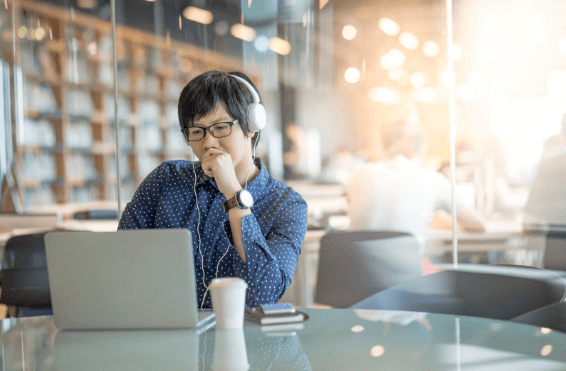 Teaching languages online is big business, and many language learning providers now provide some (or even all) of their classes via videoconferencing. As an English teacher, you’ll probably have some experience teaching English online, or at least will have thought about whether to try it out. But can you be sure that your face-to-face teaching skills will easily translate into the online environment? If you’re just starting out teaching English, what can you expect when teaching in a ‘virtual’ classroom? How can you make sure that you keep learners (particularly groups of learners) engaged, and give them plenty of opportunity to practice English? Teaching online seems like a really attractive option for many teachers. Unfortunately, teachers find that when they get into the virtual classroom, things don’t always go as well as they expected. When I started teaching groups of adults online I was already an experienced face-to-face EFL teacher, and I thought I knew how to engage students and respond to learners’ needs and interests. My face-to-face classes had lots of learner interaction and low teacher talking time. But online I suddenly found myself struggling to get students (particularly from lower-levels) to take part in speaking activities or respond to me, let alone interact with each other. I found the radio silence uncomfortable, and my teacher-talking-time went through the roof as I filled in the silence. What was going on? One of the most common media for providing materials for online classes is via a PowerPoint presentation. They’re easy to create, and can be uploaded to most online platforms. But you’ll probably have heard the expression ‘Death by PowerPoint’, and it’s particularly apt for language teaching. Once teachers have uploaded their presentation to the videoconferencing platform, there’s an enormous temptation to simply run through the presentation from start to finish, with little regard for whether students want or need the content within it. Of course, we see the same problem in the face-to-face classroom, with an inexperienced teacher ploughing willy-nilly through a course book. But the crucial difference with the online classroom is that teachers usually get far less direct feedback from their learners on how the lesson is going for them. 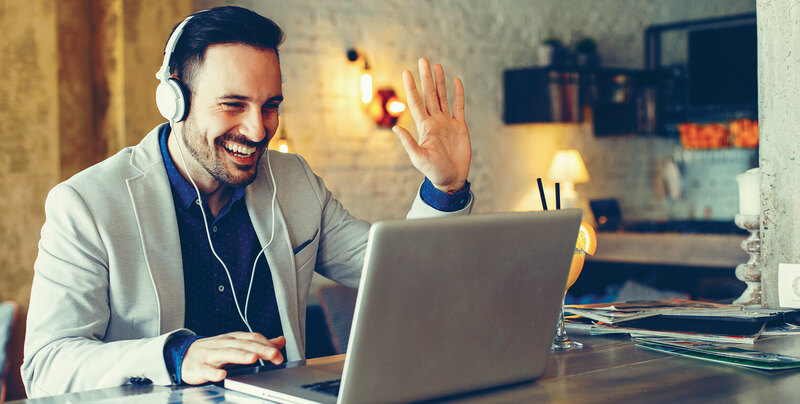 Even if your learners have their camera on (which is not always possible due to the bandwidth needed to run videoconferencing software), it can be really difficult to know why your learners aren’t saying much. Maybe they don’t understand what you’re saying, or are confused. Or maybe they think it’s too easy, so they’re bored (and checking their emails?). Maybe they’ve temporarily lost their Wi-Fi connection. Whatever the reason, as teachers talk more to fill the silence, classes become less and less learner-centred. As they have little control over the content or pace of the class, students switch off and can be easily distracted by anything else that’s going on around them. I began to realise that there was something fundamentally different about communication in a virtual classroom as compared to a face-to-face classroom. It’s actually pretty simple. In a physical classroom, you can have as many people talking at once as people in the room, and pair and group work can be used to maximize the time your students have to practice speaking in English. But in a virtual classroom (unless you’re lucky enough to have breakout rooms), you can only have one person talking at any one time without things getting pretty messy. The standard pattern of communication therefore ends up being Teacher asks a question to Student A, Student A responds, Teacher asks a question to Student B, etc., with very little interaction going on between the students (see figure 1). 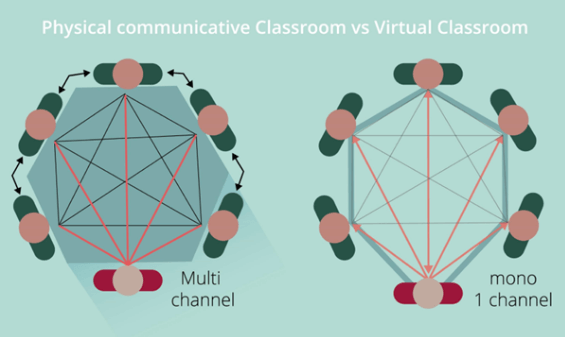 The multi-channel face-to-face communication becomes mono-channel in the Virtual classroom. What can teachers do to maximise interaction? In order to get groups of students talking and interacting in your virtual classroom, you might therefore to need to work a bit harder. But the good news is that videoconferencing platforms usually have some really great tools you can use. Here are seven ideas you can take away and use in your online classes. Set polls and quiz questions. Many videoconferencing platforms have an integrating polling function. If they don’t, you can easily share a weblink to a poll you’ve created. Use polls as a starting point for discussion, or to check understanding of a language point. And then, crucially, use the answers your students give to deviate from the PowerPoint – don’t be afraid to skip what your learners already know! Use the chat box. The chat function can be a fantastic tool for teachers in the online classroom. You can use it as a teaching aid to reinforce instructions or backchannel with a struggling student with private chat. But also think about how you can integrate the chat function into activities, by getting students to share answers, opinions, ideas etc. Write on the board. You’ll often find it’s possible to give students control to write or highlight on the whiteboard in a videoconferencing session. This can be great for brainstorming ideas or eliciting vocab, or for getting students to find mistakes in a text, or identify words. Use the record function. Set up short speaking activities, and record your learners. Then listen back to these in class, and get students to engage critically with the recordings in some way (listening for use of key language, pronunciation, or whatever your focus is). Create that information gap. Remember to make sure that your activities really are creating some kind of need to communicate between students – sounds obvious, but the clearer you are about this, the more interaction you will generate. Plan your interaction patterns. Much more than in a face-to-face class, you need to plan ahead for each task and think about how your learners can interact. It might be ‘round robin’, or you might want to specify tasks. You can also use the private chat to prompt learners to ask each other questions, and if you’re lucky, you may be able to put learners into breakout rooms. You can also think about whether you actually need to be there! Sometimes your learners will talk more freely if you set up the activity, and then turn your camera off (after having nominated one student to lead the activity). For any teacher starting their journey in online teaching, make sure you’re aware of the difficulties you might face, and plan ahead for interaction in your classroom. If you have any great ways to get learners interaction in an online classroom, please do feel free to share them with us here! The ideas in this blogpost were shared in my talk Enabling Learners to take Centre Stage in an Online Classroom as part of the Forum on Learner-centred online and blended language learning at the 2018 IATEFL conference. To see the slides for this talk, click on the links above.